As litigation (of all types) continues to become more complex, corporate counsel turn to law firms they know and trust—and can sell to their leadership with little debate. The Powerhouse and Standout law firms in the links below are the ones corporate counsel tell us they are turning to for their most pressing litigation needs in 2018. IP litigation is spreading to a broader range of industries as technology permeates more and more products. Clients report any news or allegation of even potential wrongdoing is resulting in class action suits against them. Clients are acutely sensitive to large-scale labor-related issues turning into expensive and highly public issues—the kind which can sour class actions and attract the attention of regulators. Clients point to the growing complexity of the relationships within their supply chain spurring sensitive, complex, and potentially large claims. 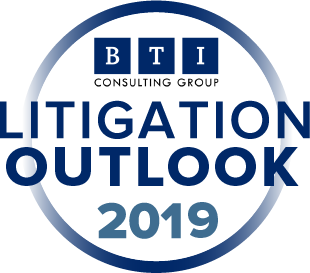 Learn more about how your firm can take advantage of how client behavior and spending is changing for 2018—and what your firm can do to adapt, in the new BTI Litigation Outlook 2018: Changes, Trends and Opportunities for Law Firms, available now. Commercial litigation reverses a 5-year slump and picks up more planned spending. CLOs point to the growing complexity of the relationships within their supply chain spurring sensitive, complex, and potentially large claims. In addition, we hear about indemnity claims growing in the financial world while companies generally seem to be more comfortable in initiating large-scale claims than they have in the past 5 years. Clients facing Product Liability actions report larger claims in a broader array of industries. A growing number of companies are selling their products on a global scale—meaning exponentially more customers using their products. Meaning exponentially more customers are exposed to potential product-related issues, providing more opportunity for plaintiff’s counsel to identify Product Liability cases—which can quickly result in a class action. The complex segment of Labor and Employment keeps getting ever more complex. Clients are acutely sensitive to large-scale labor-related issues turning into expensive and highly public issues—the kind which can sour class actions and attract the attention of regulators. These issues demand client teams and client insight. Clients also see a growing group of law firms looking to carve out their place the Labor and Employment segment. Class Action litigation keeps on growing. Clients report any news or allegation of even potential wrongdoing is resulting in class action suits against them. This can be seen in the increased number of companies reporting class action suits jumping to 59.0% this year, up from 53.8% last year. Top legal decision makers see the nature of the claims becoming broader and driving ever bigger exposure. Higher risk and broader assertions translate into a willingness to pay higher rates.